The Woof 3 delivers balanced audio and powerful bass in the size of a cup. The Woof 3 was designed with portability in mind. This palm-sized speaker delivers big sound and powerful bass for its size. Enjoy your Woof 3 everywhere with up with six hours of playtime on a single charge. 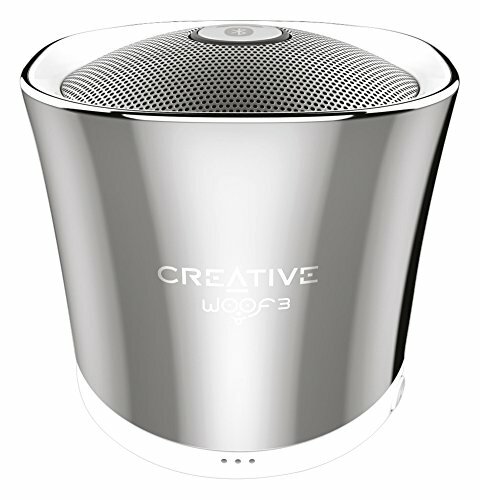 It is an all-in-one, full-featured Bluetooth MP3/FLAC speaker that's perfectly sized for life on the go. Connect any of your smart devices via Bluetooth. Control the audio wirelessly with your device. Play, pause, skip tracks, and adjust the volume anywhere in the room. Host a conference call anywhere with Woof 3's integrated microphone. The device intelligently switches between your voice calls and music so you won't have to miss another call again. The microSD slot makes a great playback option if you wish to conserve your smartphone's battery life. Simply insert a microSD card storing your favourite songs and press the play button to enjoy. Two music players in one microSD slot. Enjoy the best of both worlds from mainstream formats such as MP3/ WMA, to lossless high quality formats such as WAV/FLAC/APE - all neatly packed in one slot. Plus, it is a microSD card reader for transferring your music, video, and personal data between your microSD card and your computer. The Woof 3 comes with a micro USB cable so you can connect your PC/Mac. It will function as a USB audio device that ensures lossless digital audio playback. Plus, you can charge the speaker simultaneously. Connect your analogue devices to the Woof 3 using the 3.5 mm standard aux in cable.